These Books have gone out of print or we are closing out from our inventory. We've got a few left and they are discounted to move out. So grab these while you can! 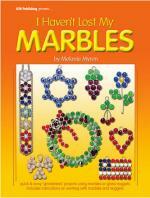 Designed with beginners in mind, features 24 "grinderless glass" projects that can be made from marbles or glass nuggets. Designs include a simple shamrock to a picture frame and a wall clock. Tips and hints are included with color photos of all finished projects.